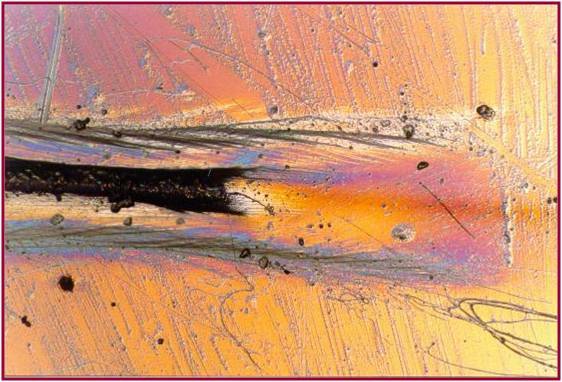 High magnification image of a crack in polycarbonate viewed in polarised light which reveals fringes that a proportional to the stress in the material. I used the term ‘unlikely to fail’ in my last post, in the context of engineering designs. This might appear alarming, since people might assume that engineers design things to never fail. However it is impossible to design with a certainty that failure will not happen. There are several reasons for this, including: the conflicting requirements of less material to reduce cost and achieve sustainability and of more material to protect against failure; our lack of knowledge about in-service and exceptional operating conditions; and the extent, or otherwise, that the computational model used in the design analysis represents the real world. Hence the phrase ‘unlikely to fail’. We can reduce the likelihood, or probability, of failure, usually at additional financial and resource cost, but we can never reduce the probability to zero, i.e. there is always a risk of failure, although we do our best to ensure that designs are ‘unlikely to fail’. This entry was posted in mechanics, uncertainty and tagged design, mechanics on September 19, 2012 by Eann Patterson.